In Consoling Thoughts on Trials of an Interior Life St. Francis de Sales, beloved Doctor of the Church, gives us treasured insight from the master of spiritual direction. How can the soul persevere in piety in the midst of affliction? How should we conduct ourselves when suffering interior trials? How can we profit from our own faults? St. Francis de Sales explains all this and more. In this masterful collection, St. Francis speaks to every soul on the riches to be gained from suffering trials and temptations, the advantages we can draw from our own defects, and how to choose and carry the best crosses. Also included are uplifting passages on suffering sadness, or what we would now call depression. 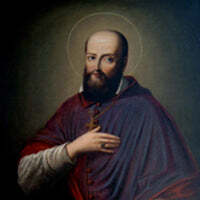 Readers of Consoling Thoughts on Trials of an Interior Life will experience firsthand why St. Francis de Sales (1567-1622) is known to history as the Gentle Saint. St. Francis was Bishop of Geneva and a tireless preacher, who yet made time to correspond with numerous souls who wrote him for his insight and guidance. His Consoling Thoughts are compiled from these letters as well as from his other spiritual works.